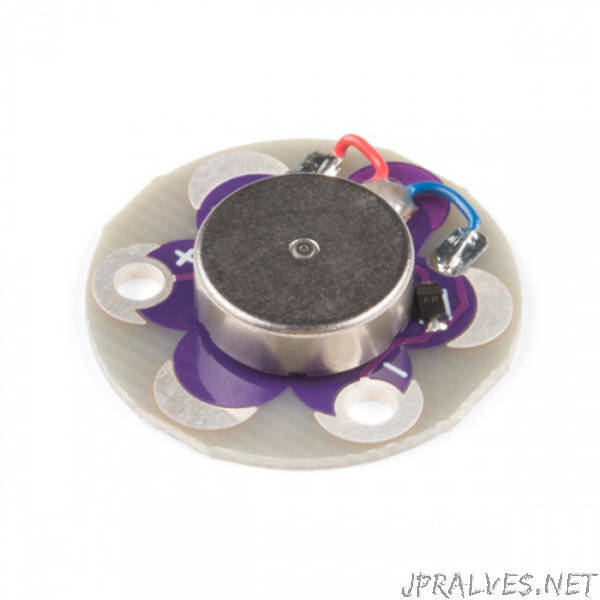 “The LilyPad Vibe Board is a small vibration motor that can be sewn into projects with conductive thread and controlled by a LilyPad Arduino. The board can be used as a physical indicator on clothing and costumes for haptic feedback. The LilyPad Vibe Board has two sew tabs: Power (+) and Ground (–). Next to each tab is a white label for reference. For power, you can connect an input voltage anywhere between 3.3V and 5V. The motor can vibrate faster as you provide more voltage. We recommend connecting the (+) tab to a MOSFET to drive the motor when using it with an Arduino due to the amount of current each I/O pin can source . To adjust the intensity, we recommend using a PWM capable sew tab on a LilyPad Arduino. To follow along with the code examples in this tutorial, connect the vibe board and transistor to a LilyPad Arduino as shown in the images below. Use alligator clips to temporarily connect the circuit. Connect the LilyPad’s “+” sew tab to the “+” sew tab of the vibe board. Make another connection between the “–” sew tab and the MOSFET power controller’s “–” sew tab. Keep in mind that the “–” label on the MOSFET power controller does not represent ground (GND or “–”). Ground is represented as “IN–”. The “IN–” should be connected to a LilyPad Arduino’s “–” sew tab.